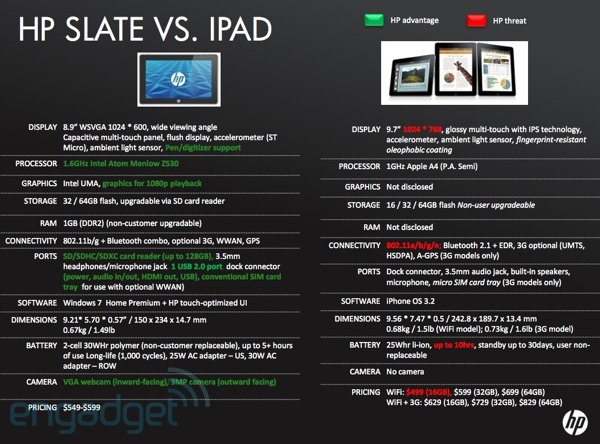 Digital Home Thoughts: HP Slate Specs Leaked? "Well, well -- what's this? We just got our hands on what looks like an internal HP Slate presentation given to cool down some of the iPad hype amongst HP employees, and it just happens to have specs and pricing details on the elusive Windows 7 tablet." This looks official enough, but anyone with moderate skills can mock up nearly anything, so I'll hold off on believing this 100%...but there's nothing on here that's difficult to believe. An Atom Z530 CPU makes sense, as does 1 GB of RAM (I wish it were 2 GB though) and everything else makes sense. It's nice to see they didn't cripple it with Windows 7 Starter edition - what with its non-background changing and all - and the two cameras are a nice addition. The hardware addresses many of the things that the iPad lacks - but the Slate clearly falls short in the battery life department when stacked up against the iPad. So what do you think? If the HP Slate comes out at $549, will you buy one?